DES MOINES – Iowa Barnstormers Head Coach and Director of Football Operations John Gregory announced today that the Arena Football league franchise has agreed to terms with Quarterback Efi Eyo along with Wide Receiver Larry Beavers for the 2011 season. Eyo (6-1, 200) joins the Barnstormers for his rookie season in the AFL. The Quarterback from Benedictine University (Lisle, IL), has spent the past three seasons with the Austin Wranglers (af2), Wichita Wild (UIF), Muskegon Thunder (CIFL). During his time at Benedictine from 2005-07 he was named team captain along the way to breaking every passing record in school history. Eyo has worked out for numerous NFL scouts and coaches, each time receiving very high marks. He is a native of Alexandria, VA where he played for T.C. Williams High School, the school featured in the 1999 movie “Remember the Titans”. Beavers (5-11, 174) also joins the Barnstormers for his rookie campaign in the AFL. Beavers has spent the last two summers in training camp with the NFL’s Carolina Panthers (2009) and New Orleans Saints (2010). Prior to that, Beavers was record setting Wide Receiver and Kick Returner at Wesley College (Annapolis, MD). He currently holds the NCAA all-divisions record for kick return touchdowns with 10 and total runbacks with 13. He ended his career with 2,366 receiving yards, second all-time at Wesley and was seventh all-time with 126 career receptions. With 41 career touchdowns between receiving, kick and punt returns, Beavers is the all-time leader in ACFC history in touchdowns scored. His 5,373 all-purpose yards are also a conference record. The Barnstormers now have 27 players under contract for the 2011 AFL season. Open tryouts are scheduled for Saturday, December 18 at Wells Fargo Arena in Des Moines. 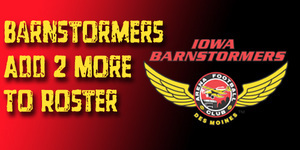 Call 515-633-2255 or visit www.theiowabarnstormers.com for more information.